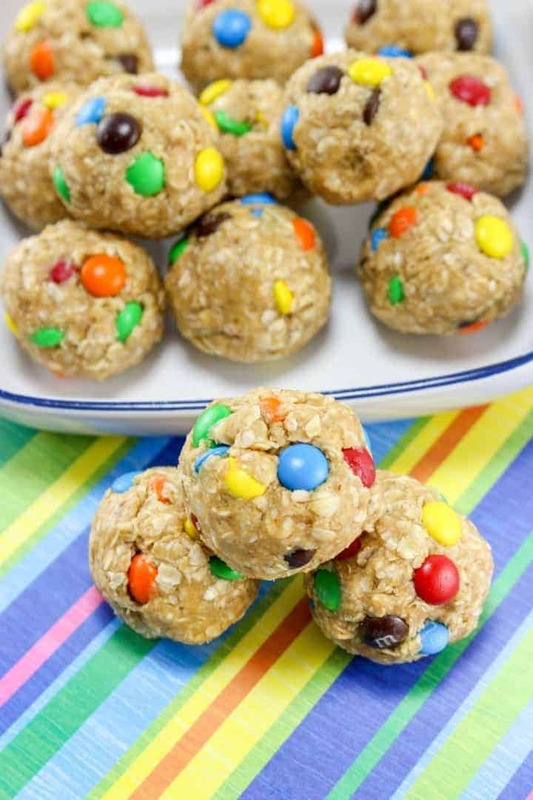 These No Bake Monster Cookie Oatmeal Energy Balls will feel like a special treat, but are actually a healthy after school snack! Our energy balls have all sorts of good stuff in them. The peanut butter not only is delicious but it is packed with protein and helps to keep those afternoon hunger pains away. 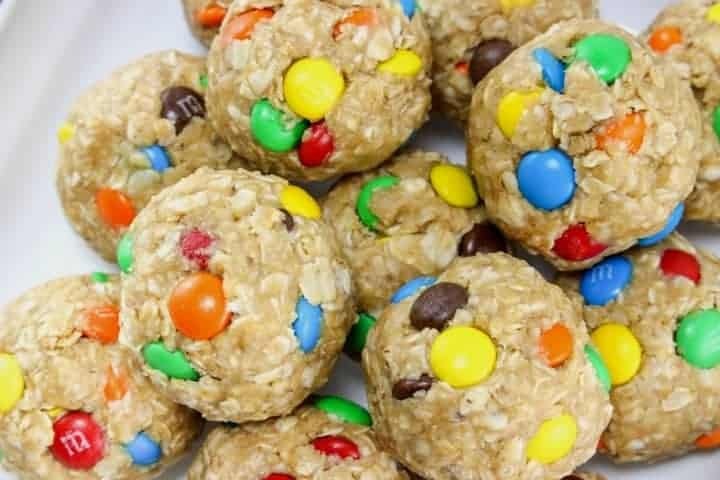 My kids come home from school starving and these No Bake Monster Cookie Energy Balls are just what they need to help curb their hunger until dinner. Oatmeal Energy Balls are perfect when it is too late for a big snack because dinner is right around the corner. 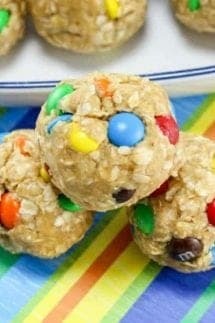 The M&M’s add just enough chocolate and color to make them fun and they will think they are getting a special treat! Looking for something similar? Check out my Peanut Butter Oatmeal Bars here – they are great if you want to leave out the M&M’s. 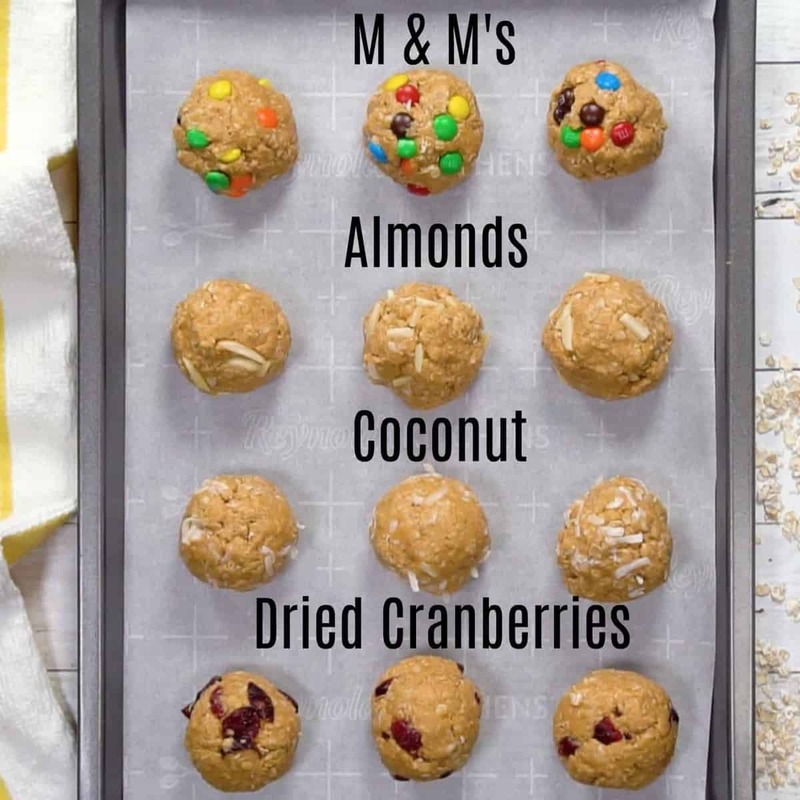 They are almost like having a cookie, but the oatmeal and peanut butter offer some healthy options and will help keep those hungry bellies full. It drives me crazy when my kids come home and raid the pantry. They are grabbing one thing after another. Then, when it is time for dinner, no one is hungry. 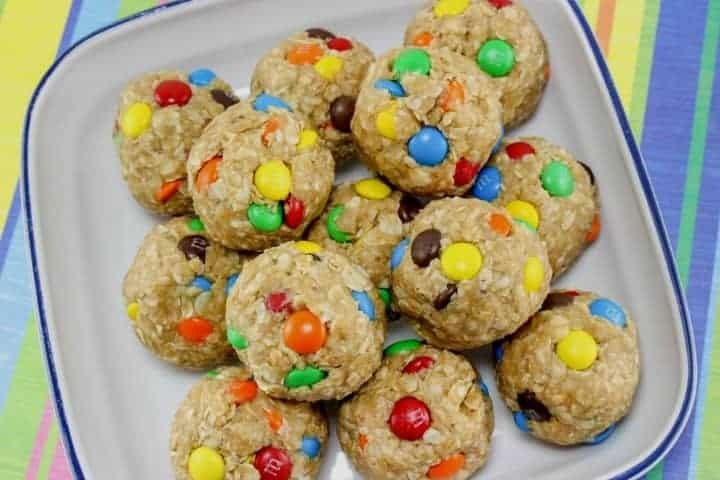 What’s even better about these Monster Cookie Oatmeal Energy Bites is that they are NO BAKE and they are super easy to make! Mixing them together takes virtually minutes and then you just need to wait for them to harden in the refrigerator, which takes about an hour. Love the idea of these balls, but looking for something chocolate free? Take a look at the Protein Balls, from my friend over at Texan Erin. How long do Energy Bites last in the fridge? If you place your energy bites in a container in the fridge, you can keep them for about a week. If you freeze them, you can keep them for up to three months! How do you freeze no-bake energy balls? Once you roll the balls, place them on a cookie sheet and place them in the freezer for about 1-2 hours. After they are frozen, place them in either an airtight container or a zip lock bag and keep them in the freezer until you are ready to eat them. Personally, I love to keep them in the freezer (they are cold and take longer to eat). Tip: keep them in the freezer and then pop them in your kids lunches – they will be perfect come lunchtime! If your school isn’t peanut free, these are also great to pack in a lunch or as an after-school snack. Can you make Energy Balls peanut free? If your school is peanut free or you have a peanut allergy, try substituting the peanut butter for sun butter, pecan butter, almond butter, cashew butter, etc. It will change the consistency and taste a bit, but try testing it out until you find one you like. The best thing about these Oatmeal Energy Balls is that there really are no rules! You can pretty much add in anything to make them exactly what you like! Try adding some “superfoods” to make them even more nutritious, like flaxseeds or chia seeds. Or instead of M&M’s, try some chocolate or cinnamon chips! Side note – a useful kitchen tool that I love is my silicon baking mat! Place the balls on a baking sheet with a silicon baking mat to keep the balls from sticking when refrigerating them. 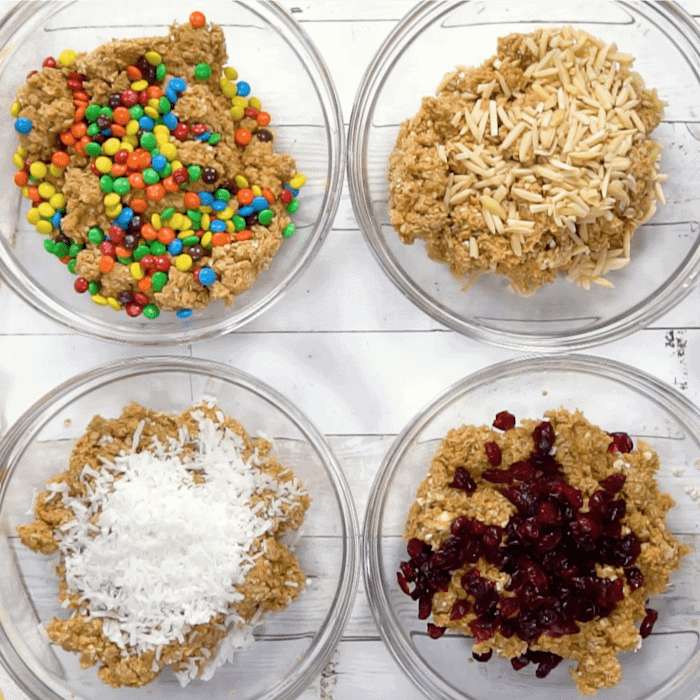 No Bake Energy Balls FOUR WAYS! Check out our how to make energy balls video below and you will see how we take the same base recipe, but make them four different ways! Want to cut down on the sugar or just looking for a variation? Try one of our other mix-in ideas. We love, coconut, dried cranberries or almonds. Just substitute these instead of the M&M’s! You can even divide the recipe in quarters and make all four varieties at once! In a small mixing bowl, combine all ingredients and mix well. Great after school snack for the kids! These are very similar to the Energy Bars, but like to cut them into small squares and freeze them. I wrap them in plastic wrap and throw one in my bag on my way to drive carpool and munch on it for a quick breakfast on the way to they gym! 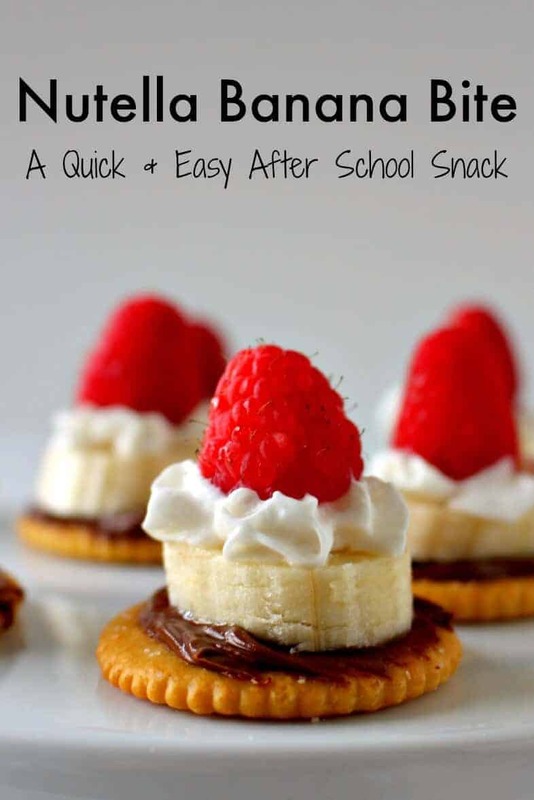 This is a quick and easy snack that your kids can make on their own. Hello – question : for the PB balls do you use quick oats or rolled ? Hi Joa! So sorry, it is Quick Oats! I should have put that in the recipe! Just edited it! Thank you for asking! My question is about the No bake monster cookies should they be kept in the refrigerator or can they be stored on the counter or in a cabinet? I keep in refrigerator! Very good. CAn you use rolled oats for this instead of quick? I made these yesterday, they are very good they almost taste like muddy buddies. The only downside is my dough was on the drier side so it was so difficult to pick balls up without them crumbling. I had the same problem whenever I made them yesterday as well. I did notice that when they sat out after being refrigerated they became smooth balls. I wonder if putting a little bit of butter in my hands would prevent them from sticking to me and crumbling. I think I’ll try that next time. ? Wet your hands before rolling them. Stops the mixture from sticking ? I made these. My son is allergic to peanuts so I used cashew butter. They turned out so good! My kids like bed them. Can you add some nutrional information? Ohja, das dachte ich mir auch! I am lactose and gluten intolerant. I would like to see more recipes labeled for my ailments instead of having to read the entire recipe. Thanks! I have celiac disease and I made these no problem just substituting for GF ingredients. Which is what I do for almost all of my baking. Do you need to cook the oats first? Do you need to cook oats first? No, do not cook the oats first. what kind of quick oats? Can you use agave instead of honey? I haven’t tried it!!! Let me know if it works if you try! 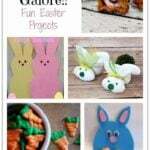 Really, thank you so much for taking the time with this blog and sharing! I’m busy with one daughter… I can only image 3 ? How many does this make ? Just wondering if there’s something I can use instead of honey? I want to make them for a family get together but have a cousin who is allergic to honey. Thanks in advance! You could try light Karo syrup instead of honey it has the same consistency. Try pure maple syrup, it’s 100% natural. My question is: 165 carbs for how many cookies and approx size you used. Awwww thanks so much! So glad they were a hit! 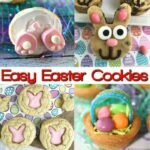 Could I add protein powder to these?